Phone Security Lite is an economical antivirus app, it can clean virus, boost. Phone Security Lite include virus cleaner, app cleaner, phone booster and antivirus. Security antivirus is important. How can you stay safe from viruses, spyware, Trojans, malwares, vulnerabilities, adwares, privacy snoopers, extortion and Wi-Fi spy? Virus Cleaner clean all viruses. Protect Private, Protect Photos, Protect Bank Information, Protect Account. Keep your android safe and secure, This is Antivirus Master. There is no background process with Phone Security Lite. 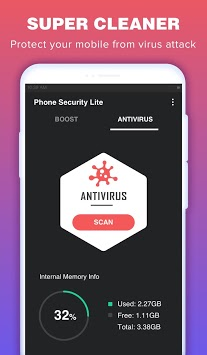 It protecting from any of extortion virus, malware, adware or Trojans with a low battery usage, our test team tested the battery usage, Phone Security Lite is the most economical antivirus app. We use a new technology to boost phone, free up RAM and save battery, normally 40% of memory can be released, get more available memory by booster. We use the features of android system itself to boost, no root privileges are required, safe and efficient. Phone Security Lite ! 100% free download, get the antivirus NOW !